I hope you like it! have a great weekend!! the portrait or the fact that i dance? Trés belle illustration du Flamenco!!! thanks so much!! i do appreciate! buen idea con las guitáras al lado de la señora. boníta! thanks a lot!!! i appreciate your comment!! thanks so much my dear Lise!! thanks so much my dear friend!! i m happy you like it! very beautiful portrait and very nice colours!!!! Love it!! Really sensual Guitars --- shaped like women... Hooray!! thanks so much my friend!! it is fun to play with curves! it could also work with a violin or other instruments! have a great day!! Even.. a French Horn! But... not a Tuba!! or an Occarina! unless it's a really big occarina! thanks so much, dear Paladino!!!!! thanks so much my dear Lanka! happy spring!! You`re welcome, lovely Alicia! the same to you, my friend! thanks so much! i love using vibrant colours like red and black! Me encantan tu mundo, tus creaciones y tus colores. Tienes mucho talento ! muchas gracias! eres muy amable! 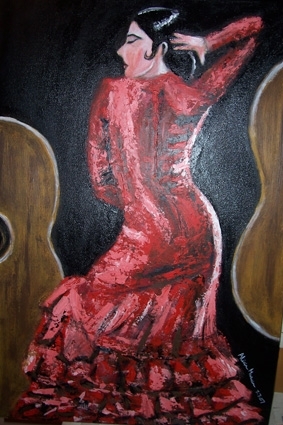 uso mucho estos colores en mis pinturas sobre el Flamenco, creo que representan bien la pasion del baile!